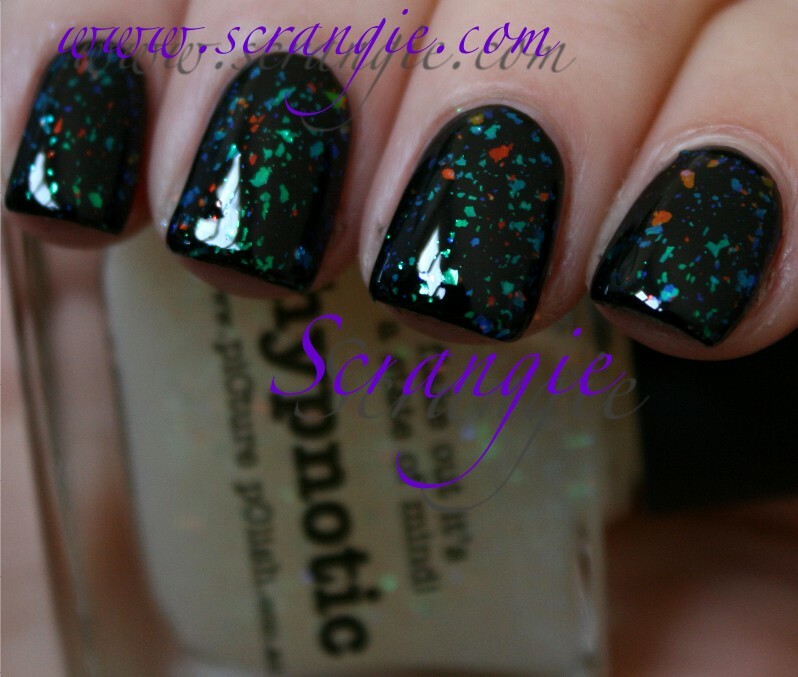 I previously posted about Picture Polish's brand new Festival Flakie Cover topcoat, and since then they've released two others: Hypnotic and Splendour. 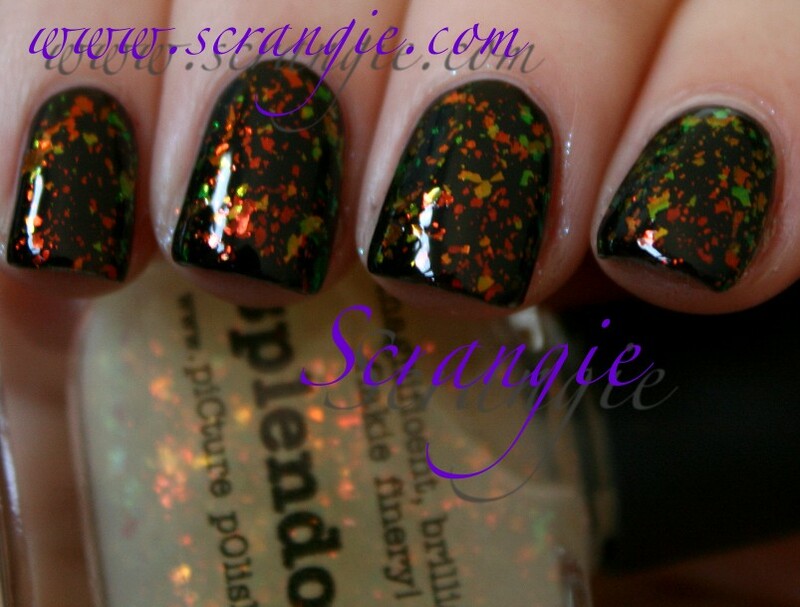 They're the same concept as Festival: fine multicolor flakes suspended in a clear base. For swatching purposes, I've layered each of these over black. It's a lot easier to see the different colors of the flakes that way. You can wear them over any color you'd like, or even on their own. 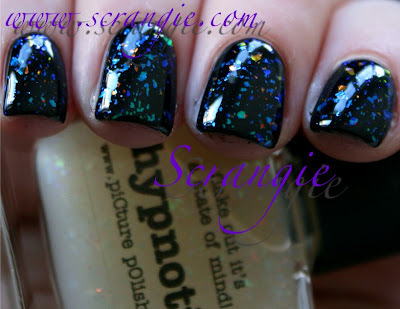 Picture Polish Hypnotic. This one is a mixture of the teal/green/blue type of flakes and a sprinkling of the red/orange flakes and blue/purple flakes. The flakes are very fine and sparse in this one. Picture Polish Splendour. This one is mostly red/orange flakes, but also has some green/blue flakes in there as well. This one's funny because it seems like they're all the same flakes (they shift between all the same colors), but they start at different points. Some of the flakes start red and shift from there, others start at gold and come back around. Kinda cool, actually. 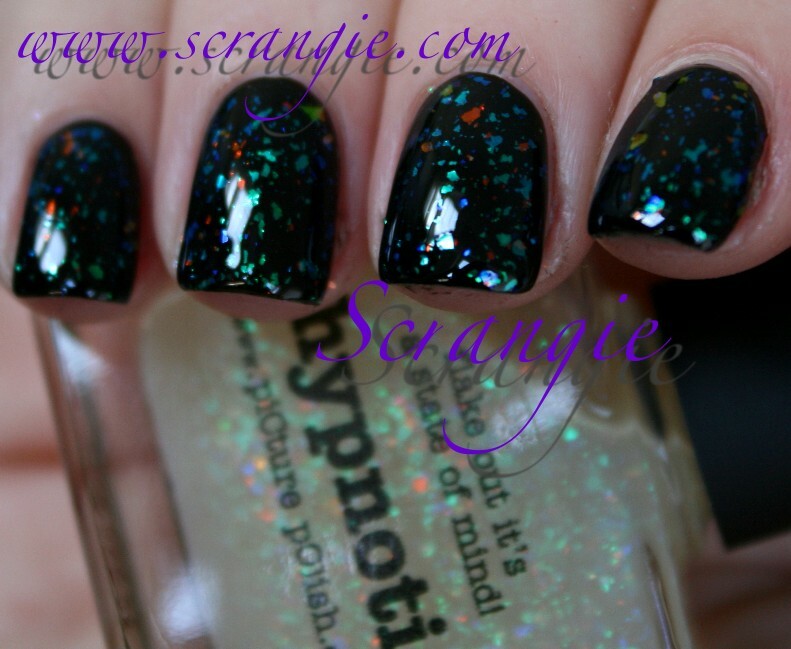 Here's Hypnotic in two coats over L'Oreal VIP Status. Odd... it seems to have clouded the base color quite a bit! 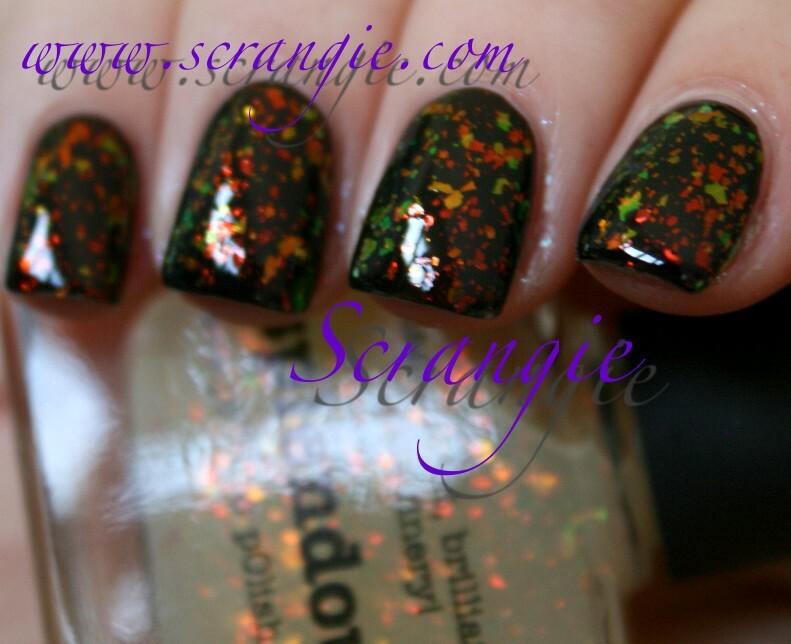 And this is Splendour in two coats, layered over an orange polish that I can't remember. Looks like fire over reds and oranges. The formula on these is, sadly, only so-so. It's thick, the flakes are very sparse, and it takes a long time to dry. I did three coats of each in the swatches over black, and I think these are a little too subtle at only one or two coats over most colors. I wish the flakes were bigger or that there were more of them in the polish so I didn't have to do as many coats. 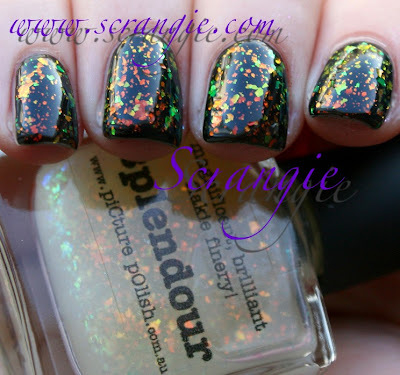 These Flakie Cover topcoats from Picture Polish are very pretty, but they have very light coverage. I prefer more of a dense coating of flakies when I wear them, so these aren't my first choice, but if you want a flake polish that can provide a more subtle look than all the rest, these might be what you're looking for. You can get these for $11.90 AUD directly from Picture Polish. They do ship internationally, so be sure to check out their rates and restrictions based on location. I have Festival and Splendour and I do love them, but like you, wish they were a wee bit less sparse! Have you tried Australis's holo flakie cover? It's a local Australian brand and very affordable (almost half the price of the Picture Polish one) and there have been some great reviews! 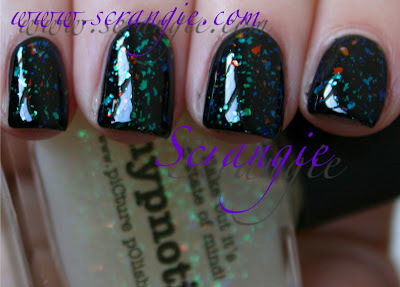 I can vouch for the Australis flakie - I'm wearing it right now over Orly Liquid Vinyl. 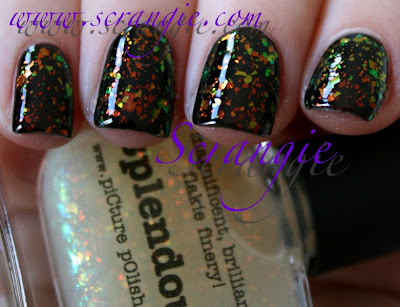 It's like a mix of Splendour and Hypnotic, a nice even mix of red/orange and blue/green flakes! Thanks for the review on the formula. I'll stick with my Finger Paints. I can't have long dry time with flakies. I'm actually surprised at that! I feel like a bad polish lover, but I'm going to admit something. I'm already feeling over flakies :X I think my biggest issue is so many come out looking very "fall" colored and I'm just not a fall-colors person. ¡Geniales! Son idénticos a los de Finger Paints. I wonder if it's the finish in polishes like VIP Status. I tried to use some of the Finger Paints flakies over Sally Hansen's Black Tie and it did the same thing. Murked the color up. I think it might be the finish on VIP Status since it's not a creme? I had the same sort of issue when I used a Finger Paints flakie over Sally Hansen's Black Tie. It murked up the color like crazy. Just thought I'd let you know that these two are now limited edition so if anyone wants them better get them quick! Festival isn't a limited edition. Sorry for the double comment, I didn't realise the first one worked. They look amazing! Especially first one! !